Jonathan Crosby asked a question on one of my GenericServices GitHub projects about how to handle a Business Layer. I thought it was a good question so I have written an article to detail my approach to building business layers that use Entity Framework. I have revisited this topic and refined my approach to Business Logic using EF. I suggest you read the new article called Architecture of Business Layer working with Entity Framework (Core and v6) – revisited. 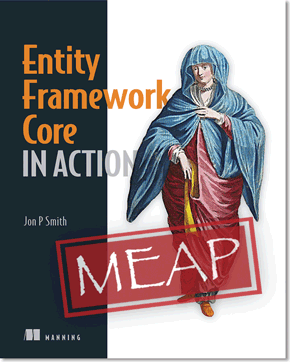 I have been commissioned my Manning Publishing to write the book Entity Framework Core in Action, in which chapter 4 is all about Business Logic in an Entity Framework Core environment (but the ideas are applicable to EF 6 too). This original article is old, but I have kept it because of all the comments. What is the Business Layer? The diagram on the left shows the type of layered application I normally build. This article is talking about the Business Layer (orange in diagram), which is called the “Domain Model” in Martin Fowler’s Service Layer diagram above. The Business Layer is the place where all the business/domain logic, i.e. rules that are particular to the problem that the application has been built to handle, lives. This might be salary calculations, data analysis modelling, or workflow such as passing a order through different stages. You can get a more in-depth coverage of the overall architecture in this Simple-Talk article. Aside: While having all the business rules in the Business Layer is something we should always strive for I find that in practice some issues go outside the Business Layer for good reasons. For instance validation of date often flows up to the Presentation Layer so that the user gets early feedback. It may also flow down to the database, which checks data written to the database, to ensure database integrity.Other business logic appears in the Presentation Layer, like not allowing users to buy unless they provide a credit card, but the status should be controlled by the Business Layer. Part of the skill is to decide whether what you are doing is justifiable or will come back and bite you later! I often get that wrong, but hopefully I learn from my mistakes. I have written numerous applications for predictive modelling of various healthcare issues, all of which have some quite complex business logic. Over the years I have tried different ways of organising these applications and I have come with one key philosophy – that the “The Business Layer is King“, i.e. its design and needs drives everything else. I am a big fan of Domain-Driven Design (DDD) which has the same philosophy and provides some approaches to help keep the business logic at the forefront of any design. Here are some of the approaches from DDD that drive my designs. The problem we are trying to solve, often called the “Domain Model”, is the heart of the problem. These can be complex so the core data structures should be defined by, and solely focused on the business problem. How it is stored and how it is viewed are secondary issues. While DDD accepts that the way data is stored/persisted will have an affect on the design (see Eric Evans book, page 159) the aim is to allow Business Layer code treat the database as almost an in-memory collection. Entity Framework really helps with this. Based on the philosophy listed above the implementation I use has the following characteristics. As I said above the Business Layer is in control of the data structures – what makes the most sense for the Business Layer is what it does. This means it normally deals in data classes and/or entity keys (DDD term for the primary keys of data/entity classes). This means the data needed/produced by the business logic is often not in the right format for communicating to the user and/or other external APIs. I therefore use Adapters, i.e. something that transforms the data to/from what the business logic. The Service Layer does this for the Business to Presentation layer communication while external services are adapted inside the Data Layer. See Alistair Cockburn’s Hexagonal/Adapter-Port architecture . My applications are mainly in this style. I use Dependency Injection to link layers. DDD call these anti-corruption layer – See Eric Evans’ talk on DDD in which he talks about different ways to adapt across Bounded Contexts (whole talk is great. Skip to 20mins in for part on linking bounded contexts). My early applications used the repository pattern and UnitOfWork pattern. However as EF has improved, and I have learnt more I have moved over to using EF directly in the Business Layer. I found that the repository pattern in the end got in the way and made life much harder. Going for direct EF access allows the developer to access all the features of EF and stops some of the ranger tortuous approaches I used to use with repositories. 3. The Business Layer does not do the final data save. This is subtle, but I have found this very helpful. I don’t want the Business Layer to really know about saving data. I can’t totally ignore the data access code, in my case Entity Framework (EF), in the Business Layer, but I do minimise it. Therefore Business Layer methods adds/inserts new data into the in-memory data classes or simply changes any loaded data from the database. However the Business Layer never calls EF’s SaveChanges. That is done in the Service Layer that called it. The Business Layer does not have to handle database validation errors, which can occur when ‘SaveChanges’ is called. The Service Layer does that, which has more information available to it on what is going on. I know that all the data will be saved in one transaction. It is either there or its not. If I need to chain multiple business methods I can use a transaction scope to rollback changes if one of the later methods fails. The Service Layer can check other things to decide whether the data should be saved. I use this to allow users to save/not save on warnings. It makes the Unit Testing of the Business Logic much easier as the database has not been changed. Most of my Business Logic has a property holding the data structures about to be written, so I can just check that. Note: The discarding of data by not calling ‘SaveChanges’ only works in situation where each call has its own DbContext. This is the state in a web application as each HTTP request gets a new DbContext. I have a library called GenericActions which has a very similar interface to the GenericServices library. Note: This isn’t an open-source library, but is part of my proprietary Rapid-Build™ library set that I use when building applications for clients. Like GenericServices GenericActions can either work directly with the business class or more usually via a Data Transfer Object (DTO) – See Why DTO? in the GenericServices documentation for more on DTOs. It uses DI to pull in a Business Layer class, hence making sure the Business Class can pick up any services it needs through constructor injection. A typical call of a business method at the MVC controller level looks very much like a GenericServices call. The main difference is the definition of the service (see line 4 above). The service contains the interface of the Business Layer class that contains the method it needs to call. DI is used to inject the right class into the service. In the case above the action only returned a status to say if it was successful or not. However other Business Layer methods may need to return data, so there is another type of call that returns a class. This class can either be the class result produced by the business class or another DTO to do the conversion. You can read about the way I implemented the GenericActions (and GenericServices) library in my new post, Using .NET Generics with a type derived at runtime. Because GenericServices is focused on the database to/from Presentation Layer communication I have not described my view of the Business Layer. Hopefully this article fills in that gap by describing the ways and wherefores of the Business Layer in my architectural view of applications.